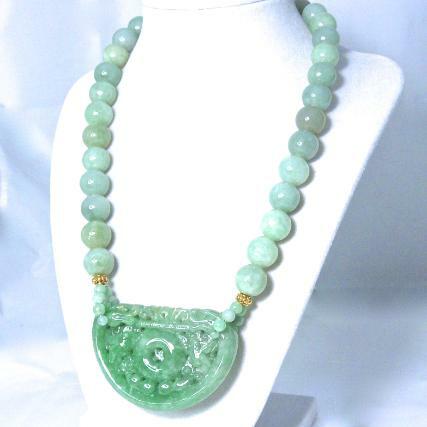 Approx 20" long including pendant, pendant 2 1/2" x 1 1/2"
This fabulous necklace is made with a gorgeous piece of carved green jade and 13 mm green jade beads. The jade is lock shaped and carved with two dragons on the top facing each other. Inside are two birds facing a pi. The carving is raised and well done. 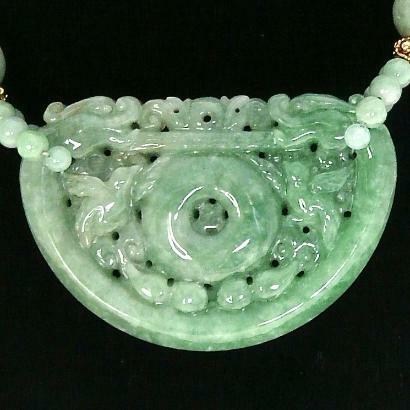 The carved jade is 2 1/2” by 1 1/2”. The necklace is 20” around and is finished with a 18k gold vermeil clasp. 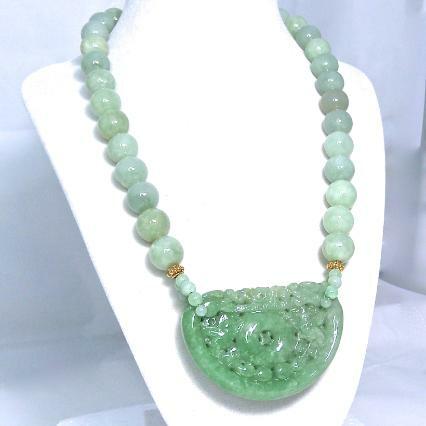 This one-of-a-kind necklace is very dramatic and versatile as it will go with many things. 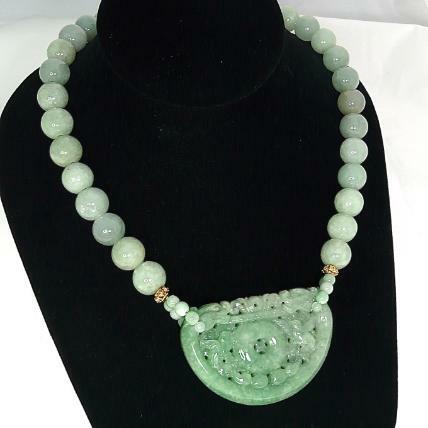 A unique and beautiful jade necklace is always in fashion. The bird is highly favored as a favorable sign. It represents the Oriental’s love of nature. Birds as pets are very important in China and many households have them. The Chinese prize the song bird especially and take very good care of them, feeding them fresh insects and taking them to the park every morning much as we would our pet dogs. It is very common the see the parks full of older men and women early the morning each with their own caged pet bird at their side. The pi is symbolic of money.